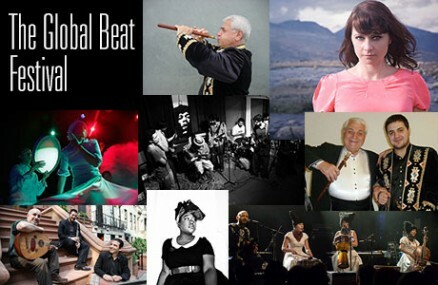 The Global Beat Festival explores music from around the world befitting the stunning acoustics of the magnificent, 10-story glass-vaulted Winter Garden. Each night pairs two groups from different traditions: opening night the stage is shared by two superb singer-songwriters France’s Mélanie Pain from Nouvelle Vague with Haitian-Canadian chanteuse Mélissa Laveaux; night two brings one of the world’s greatest living artists Jivan Gasparyan from Armenia for his final New York performance together with the distinctly creative Iranian artist Kayhan Kalhor. Night three couples the quirky indie rock of Pakistan’s Poor Rich Boy with Kiev’s visually and sonically theatrical punk-folk quartet DakhaBrakha and closing night brings Istanbul Live back to New York with Mercan Dede’s Sufi electronica together with the exceptional The Secret Trio. Mélanie Pain is best known as the lead singer of the French band Nouvelle Vague, who seduced millions around the world with her breathy renditions of 80s pop songs. For her solo career, Mélanie’s quirky, confessional chansons (sung in English and French) are a charming mix of French pop with a dash of folky Americana. A multi-instrumentalist and singer-songwriter Mélanie is known for covers like This is Not a Love Song, Teenage Kicks, and Heart of Glass. On her latest album Bye Bye Manchester she stays true to her retro pop style, while pushing ahead with a feistier sound from warped 60s surf-rock to darker new-wave influences. Paris-based, Haitian-Canadian singer-songwriter Mélissa Laveaux combines Haitian, indie-pop, soul, and blues infused songs with her distinct velvety voice and percussive fingerpicking guitar style and combines it with lush sonic textures, stunning rhythmic energy and sophisticated references to her Haitian roots. Listening to more music than she writes Mélissa fills her songs with many different nuances and influences, all seamlessly embraced like Brazilian BPM and Tropicalia, British Trip Hop, hip hop, nu-soul, and and Haitian jazz with songs in English, French, and Kreyol. You can hear traces of her earliest inspirations in her most recent highly acclaimed and elegantly eclectic EP Dying Is A Wild Night. One of the world’s greatest living artists, 86 year-old Armenian duduk maestro, Jivan Gasparyan is a legend who received worldwide critical acclaim following the release of his Brian Eno-produced album, I Will Not Be Sad in This World in the late 80s. The haunting, mournful and meditative music Jivan performs on the duduk, an ancient oboe-like instrument made of apricot wood and played using a remarkable circular breathing technique, eloquently evokes the Armenian landscape and the emotions of its people. For this farewell show Jivan introduces his grandson Jivan Jr., a great talent in his own right who will carry on his grandfather’s extraordinary legacy. One of Iran’s most beloved artists and the preeminent ambassador of Persian music, Kayhan Kalhor is a soulful master of the kamancheh, the Persian spiked fiddle. Widely known for stirring improvisations, exquisite compositions, and extensive collaborations with artists including Yo-Yo Ma, Brooklyn Rider, Kronos Quartet, Osvaldo Golijov, Ghazal Ensemble, as well as with many orchestras around the world, Kayhan has popularized Persian music in the West and is a creative force in today’s international music scene. For this evening, he will perform the US debut of a composition especially written for one of his musical icons, Jivan Gasparyan. DakhaBrakha’s accordion, bass drum, mouth harp, and cello reveal both love of tradition and post-modern punk defiance. The quartet’s astonishingly powerful and uncompromising vocal range create songs that are steeped in Ukrainian folk tradition but not bounded by it; they deploy the piercing vocal harmonies of Balkan music, the drones and systematic unfolding of Minimalism, and the drive of African dance music. Founded by former underground theater performers, the self-proclaimed “ethno-chaos group” possesses an incredible stage presence that transcends its eclectic repertoire and instrumentation. Poor Rich Boy is Pakistan’s discretely subversive, indie-art rock phenomenon, whose music conjures the strangeness of everyday life in a society where expressing one’s inner world can be both a cathartic and subtly rebellious act. Enigmatic and layered, the band’s striking vocals, atmospheric sounds, and the occasional kazoo create a crystalline sound. Well known in Lahore’s underground circuit, Poor Rich Boy is known for its energetic and pulsating live shows filled with raucous frenzy. One of Turkey’s most influential and creative artists, Mercan Dede combines electronica with Turkish Sufi, classical, and folk music to create a sound that transcends cultures and generations. Having released over 100 singles under nine different names (Arkin Allen, Poundmaker, Blueman), Dede boasts an impressive discography, covering enormous stylistic territory. With his group Istanbul Tribe, Dede hovers behind his turntables and electronics, occasionally picking up a ney flute while his ensemble on kemance (fiddle), baglama (lute), ney (flute), clarinet, and percussion and spectacular female Whirling Dervish dancer twirls to trance inducing effect. This special concert makes Dede Mercan’s first New York City appearance in 10 years! The powerful group The Secret Trio create new sounds based on Turkish, Oriental and Balkan modes on clarinet, kanun (zither), and ud (lute), weaving together delicate harmonies, rapid-fire synchrony and intricate counterpoint. Not bound to a single tradition, the group performs original compositions and classical Eastern melodies that fuse the microtonal modes and improvisations of the Middle East with dance beats of the Balkans and beyond.